Big Box is King: The big box category remains at the top of the list for the second year in a row. 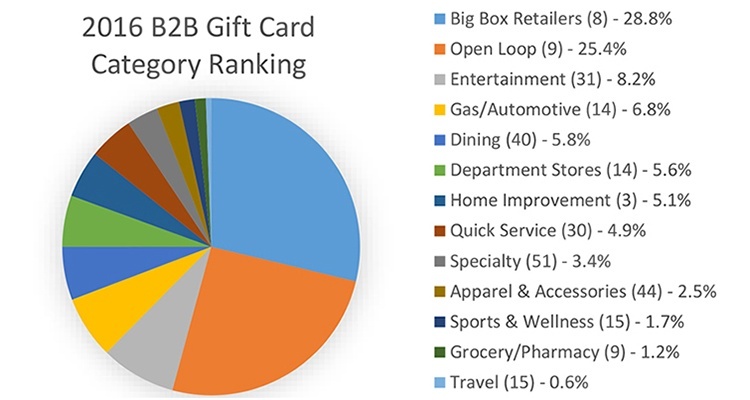 28% of total volume in gift card programs is tied to one of eight big box stores. Reflecting on the results, NGC President Eric Thiegs observes, "Participants in loyalty programs often gravitate towards rewards they can use to stretch family budgets. For instance, cards for shopping, dining, home or automotive needs that can be used for everyday essentials (or given as gifts to loved ones for the holidays or special occasions) make a difference to the household bottom line. The top gift card reward selections conveniently match consumer desires to save money." This latest analysis also found plastic gift card redemption doesn't appear to be going away anytime soon. While slowly rising in popularity each year, eGift card redemption still accounts for less than 15% of B2B gift card volume compared to 85% for physical gift cards. "There's a substantial population of Gen X and Baby Boomers who prefer to redeem their points, miles and cash back rewards for physical gift cards. More Millennials select eGift card rewards, but there is also some digital backlash as end-users experience eCard technology issues, training gaps at the point of sale, confusion with mobile wallets, or even fraud,” said Thiegs. “The world is digital, and loyalty programs will need to continue evolving to provide choices for both physical and digital reward options, but physical gift cards will continue to be perceived by many to be the safest and most universal option for years," he concluded. The above statistics were generated by monitoring gift card purchases from thousands of corporate clients in the loyalty, rewards and incentive markets generating several hundred million dollars in B2B gift card volume in the United States.